Regeneration responses in animals are widespread across phyla. To identify molecular players that confer regenerative capacities to non-regenerative species is of key relevance for basic research and translational approaches. Here, we report a differential response in retinal regeneration between medaka (Oryzias latipes) and zebrafish (Danio rerio). In contrast to zebrafish, medaka Müller glia (olMG) cells behave like progenitors and exhibit a restricted capacity to regenerate the retina. After injury, olMG cells proliferate but fail to self-renew and ultimately only restore photoreceptors. In our injury paradigm, we observed that in contrast to zebrafish, proliferating olMG cells do not maintain sox2 expression. Sustained sox2 expression in olMG cells confers regenerative responses similar to those of zebrafish MG (drMG) cells. We show that a single, cell-autonomous factor reprograms olMG cells and establishes a regeneration-like mode. Our results position medaka as an attractive model to delineate key regeneration factors with translational potential. All animals have at least some ability to repair their bodies after injury. But certain species can regenerate entire body parts and even internal organs. Salamanders, for example, can regrow their tail and limbs, as well as their eyes and heart. Many species of fish can also regenerate organs and tissues. In comparison, mammals have only limited regenerative capacity. Why does regeneration vary between species, and is it possible to convert a non-regenerating system into a regenerating one? Laboratory studies of regeneration often use the model organism, zebrafish. Zebrafish can restore their sight after an eye injury by regenerating the retina, the light-sensitive tissue at the back of the eye. They are able to do this thanks to cells in the retina called Müller glial cells. These behave like stem cells. They divide to produce identical copies of themselves, which then transform into all of the different cell types necessary to produce a new retina. Lust and Wittbrodt now show that a distant relative of the zebrafish, the Japanese ricefish ‘medaka’, lacks these regenerative skills. Although Müller glial cells in medaka also divide after injury, they give rise to only a single type of retinal cell. This means that these fish cannot regenerate an entire retina. Lust and Wittbrodt demonstrate that in medaka, but not zebrafish, levels of a protein called Sox2 fall after eye injury. 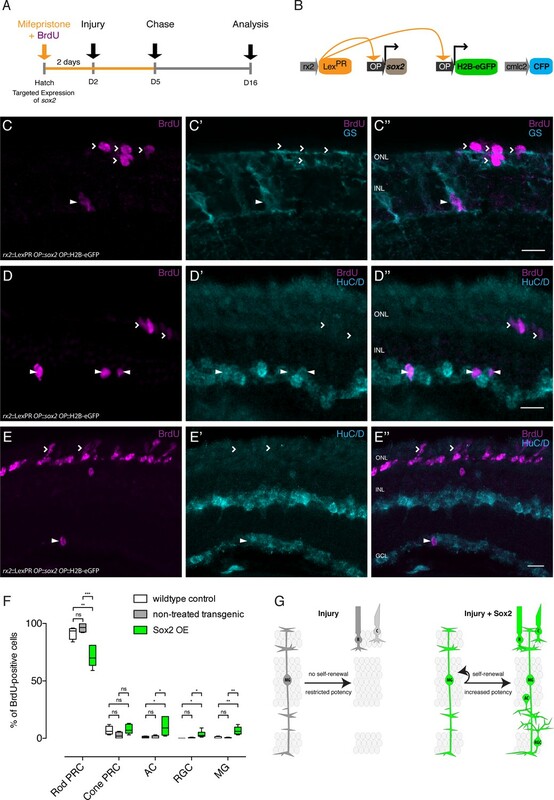 As Sox2 has been shown to be important for regeneration in zebrafish Müller glial cells, the loss of Sox2 may be preventing regeneration in medaka. Consistent with this, restoring Sox2 levels in medaka Müller glial cells enabled them to turn into several different types of retinal cell. Sox2 is also present in the Müller glial cells of other species with backbones, including chickens, mice, and humans. Future experiments should test whether loss of Sox2 after injury contributes to the lack of regeneration in these species. If it does, the next question will be whether restoring Sox2 can drive a regenerative response. The ability to regenerate individual cells, lost organs or even the structure of the entire body is widespread in the animal kingdom. The means by which certain species achieve remarkable feats of regeneration, whereas others have restricted or no capacity to do so is poorly understood. Teleost fishes are widely used models to study development, growth and regeneration of the visual system (Centanin et al., 2011; Raymond et al., 1988, 2006; Rembold et al., 2006). The retina of these fish undergoes lifelong neurogenesis, and the range of retinal cell types is generated from two sources. 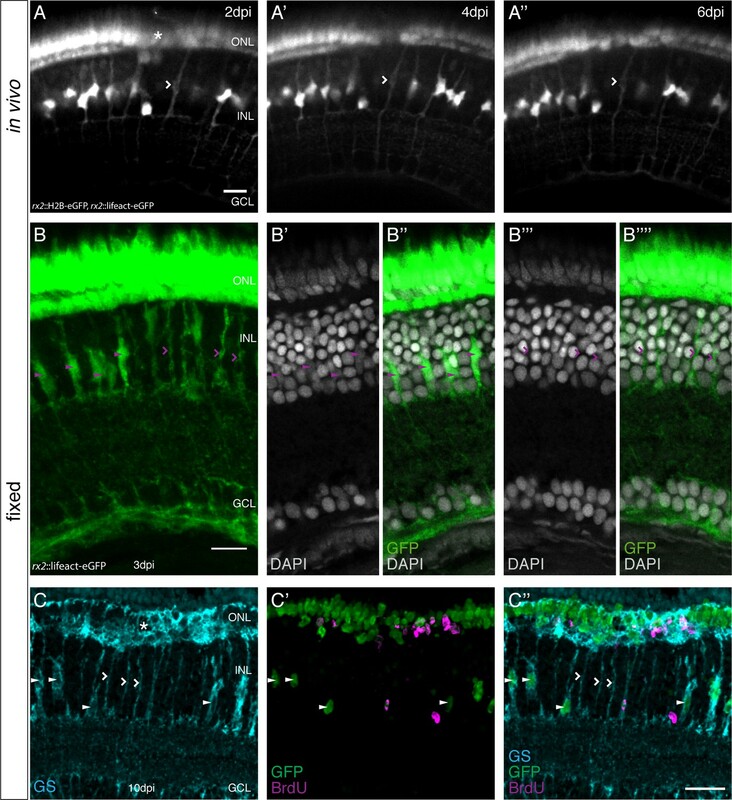 The first are the cells of the ciliary marginal zone (CMZ), which include retinal stem cells that give rise to progenitor cells and ultimately differentiated cell types of the growing neural retina (Centanin et al., 2011, 2014; Raymond et al., 2006). A second source for new retinal cells are Müller glia (MG) cells, which generate new cell types during homeostasis and regeneration (Bernardos et al., 2007). Some teleost species, including goldfish (Carassius auratus) and zebrafish (Danio rerio), have been analyzed with respect to their ability to regenerate the retina and recover visual function after injuries (Bernardos et al., 2007; Braisted and Raymond, 1992; Raymond et al., 1988; Sherpa et al., 2008). Among these, zebrafish is the best-studied and has been shown to contain multipotent MG cells which can self-renew and regenerate all retinal neuronal and glial cell types after injuries. It is currently assumed that other teleost species possess the same regenerative capacities; however, detailed analyses have been lacking. To investigate MG cell-mediated retina regeneration in a distantly related teleost, we chose the Japanese ricefish medaka (Oryzias latipes), which is a well-established model organism that shared its last common ancestor with zebrafish between 200 and 300 million years ago (Schartl et al., 2013). Few regeneration studies have been carried out in medaka, but the literature reveals some interesting differences to zebrafish. Whereas fins can be fully regenerated in adult medaka (Nakatani et al., 2007), the heart has no regenerative capacity (Ito et al., 2014; Lai et al., 2017). The development and growth of the neural retina of medaka has been studied (Centanin et al., 2011, 2014; Martinez-Morales et al., 2009), but regeneration studies are missing. 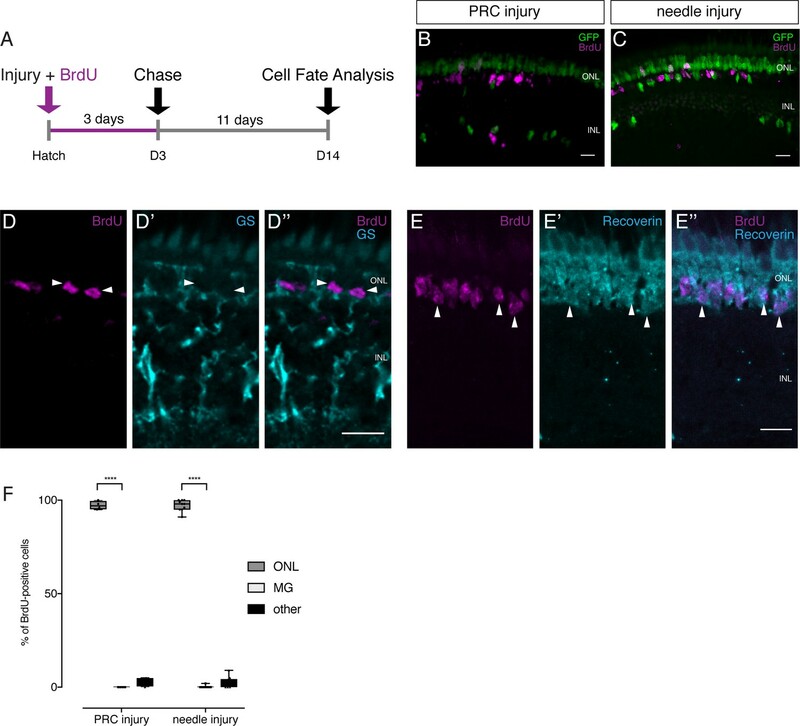 After injuries, multipotent MG cells of the zebrafish retina have been shown to upregulate the expression of pluripotency factors including lin-28, oct-4, c-myc and sox2 (Ramachandran et al., 2010). Sox2 is well known for its role in maintaining the pluripotency of embryonic stem cells (Masui et al., 2007) and is one of the four original Yamanaka factors required for the generation of induced pluripotent stem cells (Takahashi et al., 2007). Sox2 has been frequently used in reprogramming studies, such as the conversion of mouse and human fibroblasts directly into induced neural stem cells (Ring et al., 2012), or the transformation of NG2 glia into functional neurons following stab lesions in the adult mouse cerebral cortex (Heinrich et al., 2014). In the regenerating zebrafish retina, sox2 expression is upregulated 2 days post injury (dpi) and is necessary and sufficient for the MG proliferation associated with regeneration (Ramachandran et al., 2010; Gorsuch et al., 2017). In the present study, we find that medaka MG (olMG) cells display a restricted regenerative potential after injury and only generate photoreceptors (PRCs). We observed that olMG cells can re-enter the cell cycle after injures but fail to divide asymmetrically or generate neurogenic clusters, two steps which are essential to full regeneration. Using in vivo imaging, two-photon mediated specific cell ablations and lineage tracing, we find that olMG cells react preferentially to injuries of PRCs and are only able to regenerate this cell type. We demonstrate that sox2 is expressed in olMG cells in the absence of injury but, in contrast to zebrafish, is not maintained in proliferating olMG cells after injury. We show that inducing targeted expression of sox2 in olMG cells is sufficient to shift olMG cells into a regenerative mode reminiscent of zebrafish, where they self-renew and regenerate multiple retinal cell types. In contrast to zebrafish and goldfish, where MG cells are described as the source of rod PRCs that gradually accumulate during the early larval period (Bernardos et al., 2007; Nelson et al., 2008), it has been shown previously that olMG cells are quiescent at a comparable developmental stage in the hatchling (8 dpf) retina (Lust et al., 2016). 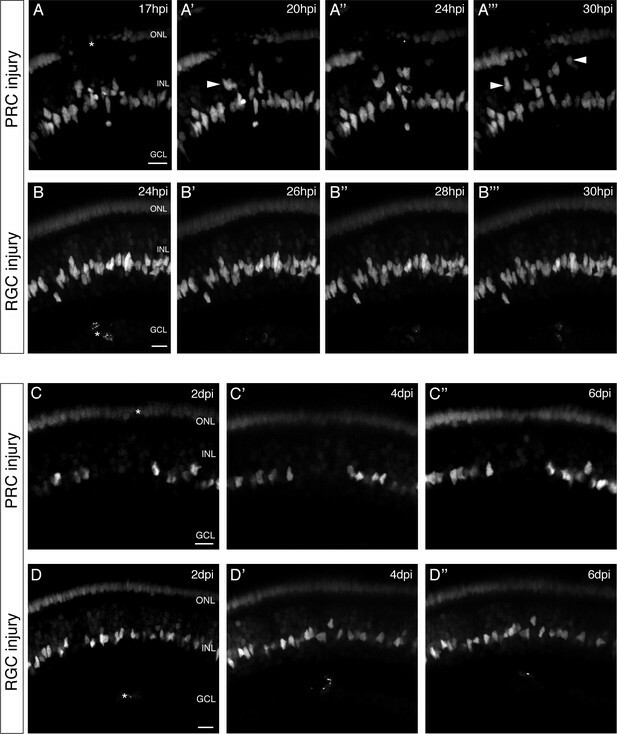 While the zebrafish retina massively increases its rod PRC number during post-embryonic growth (Figure 1—figure supplement 1A–B''') via the proliferation of MG cells (Bernardos et al., 2007), the medaka retina maintains its rod PRC layer from embryonic to adult stages (Figure 1—figure supplement 1C–D''') and rod PRCs are born from the CMZ (Figure 1—figure supplement 2). In order to address the regenerative abilities of olMG cells we used the rx2::H2B-eGFP transgenic line that labels the CMZ, olMG cells and cone PRCs but no rods in hatchling (8dpf) and adult medaka (Martinez-Morales et al., 2009; Reinhardt et al., 2015) (Figure 1—figure supplement 3). To investigate the reaction of olMG cells and the retina upon injury, we performed needle injuries on rx2::H2B-eGFP transgenic fish. To label cells re-entering the cell cycle we subsequently analyzed the fish either by immunohistochemistry for the mitotic marker phospho-histone H3 (PH3) at 3 dpi or incubated them in BrdU for 3 days to label cells in S-phase. We detected proliferating cells in the central retina, on the basis of both labels PH3 (Figure 1A–1A’’) and BrdU (Figure 1B–1B’’) 3 days after a needle injury. These proliferating cells were also positive for rx2-driven H2B-eGFP, showing that the olMG cells had re-entered the cell cycle. These results demonstrate that olMG cells in hatchling medaka are quiescent in an uninjured background (Lust et al., 2016), but begin to proliferate upon injury. olMG cells re-enter the cell cycle after injury but do not generate neurogenic clusters. (A–A’’) Cryosection of a needle-injured hatchling medaka retina of the transgenic line rx2::H2B-eGFP. PH3 stainings (magenta) on the hatchling medaka retinae 3 days post needle injury show mitotic cells present in the central retina (arrowhead), co-localizing with the rx2 nuclear reporter expression (green). (n = 4 fish, data obtained from two independent experiments). (B–B’’) Cryosection of a needle-injured hatchling medaka retina of the transgenic line rx2::H2B-eGFP. A 3-day pulse of BrdU marks proliferating cells in the central retina after needle injury (arrowheads). BrdU staining (magenta) co-localizes with rx2 nuclear reporter expression (green), indicating that olMG cells re-entered the cell cycle. (n = 6 fish, data obtained from three independent experiments). (C, C') Cryosection of a needle-injured hatchling medaka retina. BrdU-positive (magenta) single cells are present in the INL and ONL. (n = 6 fish, data obtained from two independent experiments). (D, D') Cryosection of a needle-injured zebrafish retina. BrdU-positive (magenta) neurogenic clusters are present in the INL. Additionally, BrdU-positive proliferating cells can be detected in the ONL (n = 3 fish, data obtained from two independent experiments). Scale bars are 10 μm. The onset of MG proliferation in zebrafish has been observed between 1 and 2 dpi (Fausett and Goldman, 2006). To understand if olMG cells show a similar mode of activation, we performed BrdU incorporation experiments and analyzed time-points after injury ranging from 1 dpi until 3 dpi. At 1 dpi, no BrdU-positive cells were detected in the retina (data not shown). At 2 dpi, the first BrdU-positive cells were detected in the inner nuclear layer (INL) and the outer nuclear layer (ONL) of the central retina (Figure 1—figure supplement 4A–B'''). Co-localization with GFP showed that these cells are olMG cells or olMG-derived cells (Figure 1—figure supplement 4A–B'''). In response to injury olMG cells initiate DNA synthesis and divide maximally once as indicated by the appearance of single or a maximum of two BrdU-positive cells next to each other in the INL at both 2 dpi and 3 dpi (Figure 1C and C'). In contrast, the injury response of zebrafish MG (drMG) cells at comparable stages (4dpf) is characterized by the formation of large nuclear, neurogenic clusters in the INL (Figure 1D and D'). This is consistent with the response of adult drMG cells to injury in which a single asymmetric division produces a MG cell and a progenitor cell that divides rapidly to generate neurogenic clusters (Nagashima et al., 2013). These results show that olMG cells start re-entering the cell cycle between 1 and 2 dpi but do not generate neurogenic clusters. For proper regeneration to occur, the appropriate cell types must be produced. This requires not only the regulation of the proliferation of stem or progenitor cells, but also the proper control of lineage decisions in the progenitors. If and when fate decisions are made by the MG cells or proliferating progenitors during regeneration is largely unknown. To study whether different injury sites (PRC or retinal ganglion cell (RGC) injury) result in a differential response of olMG cells, we used two-photon mediated ablations and consecutive imaging (Figure 2—figure supplement 1A–D) and addressed their behavior in immediate (up to 30 hours post injury (hpi)) and late (until 6 dpi) response to injury. We induced PRC injuries in medaka and observed that olMG nuclei below the wound site started migrating apically at 17 hpi (Figure 2A–2A''', see also Figure 2—video 1). These migrations were not coordinated between individual cells. Some nuclei migrated into the ONL, whereas others stayed at the apical part of the INL. Nuclei farther from the wound site did not migrate in response to the injuries. In contrast, after RGC injuries, there was no migration of olMG nuclei, either apically or basally toward the wound, within the first 30 hpi (Figure 2B–2B''', see also Figure 2—video 1). olMG cells react preferentially to PRC injuries by apical migration. (A–B’’’) In vivo imaging of hatchling rx2::H2B-eGFP medaka retinae which were either injured in the ONL or the ganglion cell layer (GCL) (asterisks) using a two-photon laser and imaged consecutively until 30 hpi (n > 10 fish each, data obtained from >10 independent experiments each). (A–A’’’) After PRC injuries olMG nuclei (arrowheads) start migrating apically towards the ONL layer from 17 hpi on. The migration is not coordinated among different migrating nuclei. (B–B’’’) After RGC injuries no migration of olMG nuclei can be detected until 30 hpi. Scale bars are 10 μm. (C–D’’) In vivo imaging of hatchling rx2::H2B-eGFP medaka retinae which were either injured in the ONL or the GCL (asterisks) using a two-photon laser and imaged every second day after injury (n > 10 fish each, data obtained from >10 independent experiments each). (C–C’’) PRC injuries result in an apical migration of olMG nuclei into the injury site. The following days until 6 dpi the nuclei do not migrate back toward the INL resulting in a gap of olMG nuclei in the INL. (D–D’’) After RGC injuries no migration of olMG nuclei can be detected until 6 dpi. Scale bars are 10 μm. To investigate whether olMG nuclei migrate back at later time-points after PRC injuries or show any migratory behavior after RGC injuries, we re-imaged the injury site at 2-day intervals to follow an injured retina up to 6 dpi. At 2 dpi, retinae with PRC injuries showed a gap in the INL below the injury site, at a position where olMG nuclei are normally found, reflecting the migration of olMG nuclei towards the ONL from this location (Figure 2C–2C''). The gap in the INL persisted until 6 dpi (Figure 2C''). The reaction of olMG cells in retinae with RGC injuries differed. Here, we neither observed an apical nor basal migration of olMG nuclei (Figure 2D–2D'') and in fact no migration of olMG nuclei was observed at all until 6 dpi. To rule out that this is due to too little damage in the RGC layer we increased the injury size. This led to swelling and secondary cell death of PRCs and activated olMG nuclei to migrate apically (Figure 2—figure supplement 2A–B), indicating further that their preferential reaction is toward PRC injuries. Taken together, these results show that olMG nuclei migrate toward PRC injury sites within 24 hpi and remain in this location up until 6 days, whereas they display no discernible reaction toward RGC injuries. This indicates a clear preferential reaction of olMG nuclei to refill the injured PRC layer. Long-term in vivo imaging of fish that were injured in the ONL made it apparent that olMG nuclei migrate apically into the wound site but remain there which might indicate a complete remodeling of the soma of these neuroepithelial cells. To understand whether cell bodies of the olMG cells remain intact during this nuclear migration, we analyzed nuclear movements (transgenic line rx2::H2B-eGFP) in the context of the olMG cell body (transgenic line rx2::lifeact-eGFP). We imaged the double transgenic animals at 2-day intervals following ONL injuries. As previously observed, olMG nuclei migrated out of the INL into the wound site (Figure 3A–3A''). The rx2::lifeact-eGFP labeled cell bodies of the olMG cells spanning the entire apico-basal distance remained intact until 6 dpi in the absence of an apparent (labeled) nucleus in the INL (Figure 3A''). The earlier position of the nucleus was still recognizable by a slight enlargement of the soma. olMG nuclei are depleted after PRC injuries without cell body loss. (A–A’’) In vivo imaging of a hatchling rx2::H2B-eGFP, rx2::lifeact-eGFP medaka retina which was injured in the ONL (asterisk) and imaged every second day after injury. Close to the injury site an olMG cell body without a nucleus can be detected at 2 dpi (A, empty arrowhead). The empty process remains until 6 dpi (A”) (n = 3 fish, data obtained from three independent experiments). Scale bar is 10 μm. (B–B’’’’) Maximum projection (B) and single planes of a cryosection of the injured hatchling medaka retina of the transgenic line rx2::lifeact-eGFP. The fish were injured, incubated in BrdU for 3 days and fixed at 3 dpi. Both GFP-positive cell bodies (green) which contain (arrowheads) and do not contain (empty arrowheads) a nucleus anymore are present. (n = 6 fish, data obtained from two independent experiments). Scale bar is 10 μm. (C–C’’) Maximum projection of a cryosection of the injured hatchling medaka retina of the transgenic line rx2::H2B-eGFP. The fish were injured in the ONL (asterisk), incubated in BrdU for 3 days and fixed at 10 dpi. Many GFP-positive nuclei (green) are located in the ONL, some co-localizing with BrdU (magenta). In the INL few GFP-positive nuclei are present. Many GS-positive (cyan) olMG cell bodies below the injury site do not contain a GFP-positive nucleus (empty arrowheads). Next to the empty cell bodies GFP-positive nuclei can be detected within GS-positive cell bodies (arrowheads) (n = 4 fish, data obtained from two independent experiments). Scale bar is 20 μm. Additionally, to extend the range of analysis, we performed immunohistochemistry on injured fish at 3 and 10 dpi. After injury, incubation in BrdU for 3 days and direct fixation at 3 dpi we found that at the site of injury the GFP-positive cell bodies, labeled by rx2::lifeact-eGFP, did not contain a nucleus anymore while the neighboring, more distant GFP-positive cell bodies contained elongated olMG nuclei (Figure 3B–B'''', see also Figure 3—video 1). After incubation in BrdU for 3 days and fixation at 10 dpi, we observed similar results (Figure 3C–3C''). Here, we used immunohistochemistry to detect the olMG cell bodies via a GS-staining (Figure 3C). BrdU-positive cells in the ONL mark the site of the injury (Figure 3C''). In the region directly underneath the site of injury, the majority of olMG nuclei, which had been labeled by rx2::H2B-eGFP, were absent from the INL (Figure 3C''). GS-positive cell bodies remained spanning the entire apico-basal height, but without the apparent presence of nuclei. In contrast, unaffected GS-positive olMG cells located on either side of the wound site still contained their nuclei, as easily detected by the large size of the soma. This data shows that the cell bodies of injury-activated olMG cells are still intact despite the migration of their nuclei into the ONL. Since the injury response of olMG cells apparently does not involve self-renewal of olMG cells we wondered about the position and orientation of the cell division plane, a factor which has been associated with cell fate in various systems. We first addressed the apico-basal position of dividing olMG cells by PH3 immunohistochemistry after injury. We detected PH3-positive cells only in the INL (Figure 4A–4A''). Some dividing cells were located more apically (Figure 4A–4A''), while others were located more basally (Figure 4—figure supplement 1A–B). This is in contrast to findings in zebrafish where, in a light injury paradigm, PH3-positive drMG cells can be found in the ONL 2 days after injury (Nagashima et al., 2013). olMG cells divide in the INL with an apico-basal spindle orientation. (A–A’’) Cryosection of an injured hatchling medaka retina of the transgenic line rx2::H2B-eGFP. PH3 stainings (magenta) on hatchling medaka retinae 3 days post PRC injury show mitotic olMG cells present in the INL (arrowhead), co-localizing with the rx2 nuclear reporter expression (green) (n = 4 fish, data obtained from three independent experiments). (B–B’’’) In vivo imaging of hatchling rx2::H2B-eGFP medaka retinae which were injured in the ONL and imaged starting at 44 hpi. OlMG nuclei which start to condense their chromatin can be detected in the INL (arrowheads). The divisions occur in an apico-basal manner (n = 6 fish, data obtained from six independent experiments, 5 out of 6 imaged divisions were apico-basal). Scale bars are 10 μm. To address the cleavage plane of dividing olMG cells, we employed in vivo imaging of rx2::H2B-eGFP fish, which permits visualizing the separation of chromatin and thus gives a measurement of the orientation of division. The first injury-triggered olMG divisions were observed at 44 hpi (Figure 4B–4B''', see also Figure 4—video 1). They occurred in the INL, both in the center and close to the ONL (Figure 4—figure supplement 1C–C'''). The mode of division was preferentially apico-basal (5 out of 6 divisions in 5 out of 6 animals), while only a single horizontal division was observed (1 out of 6 divisions in 1 out of 6 animals). In contrast, drMG cells are reported to predominantly divide with a horizontal division plane (Lahne et al., 2015). These results show that injury-induced olMG cell divisions occur in different positions in the INL and have a strong preference to occur apico-basally. In zebrafish, drMG cells are able to regenerate all neuronal cell types and self-renew after injury (Nagashima et al., 2013; Powell et al., 2016). We followed a BrdU-based lineage-tracing approach successfully applied in zebrafish (Fausett and Goldman, 2006; Powell et al., 2016) to address the potency of olMG cells. Transgenic rx2::H2B-eGFP fish retinae were injured either by two-photon laser ablation of PRCs or RGCs specifically or using a needle ablating all cell types. The injured fish were incubated in BrdU for 3 days to label proliferating cells. This allows to efficiently detect all injury-triggered S-phase entry of olMG cells (Figure 5—figure supplement 1A–D). For lineaging, fish were grown until 14 dpi to allow a regeneration response and subsequently analyzed for BrdU-positive cells in the different retinal layers (Figure 5A). PRC injuries led to the detection of 97% of all BrdU-positive cells in the ONL, mostly in the rod nuclear layer, indicative for PRC fate (Figure 5B and E). No BrdU-positive cells could be detected in the INL. Additionally, we found that the INL below the injury site was devoid of olMG cell nuclei, both consistently arguing for the absence of injury-triggered olMG self-renewal. Strikingly, RGC injuries did not trigger BrdU-uptake in olMG cells or any other differentiated cell type (data not shown). Needle injuries affecting all retinal cell types triggered the same response as the specific lesions in the PRC layer. 97% of all BrdU-positive cells were present in the ONL, and only a single BrdU-positive olMG cell was found in 1 of 10 fish (Figure 5C and E). Also later application of BrdU after injury (4 to 7 dpi) did not result in BrdU-positive olMG cells (Figure 5—figure supplement 2A–C). Importantly, BrdU-positive nuclei were not positive for GS, indicating that they were not olMG cells anymore (Figure 5D), but were positive for Recoverin, a PRC marker (Figure 5E). These results demonstrate that olMG cells do not self-renew and rather function as mono-potent repair system restricted to the generation of PRCs, most of which belong to the rod lineage. Lineage tracing after injuries reveals the preferential regeneration of PRCs. (A) Scheme outlining the experimental procedure. Hatchling medaka were injured in the retina with a two-photon laser ablating either PRCs or RGCs or with a needle ablating all cell types. The fish were incubated in BrdU for 3 days and analyzed at 14 dpi. (B–C) PRC injuries result in BrdU-positive cells in the ONL, mostly in the rod layer. No BrdU-positive olMG cells are present and fewer GFP-positive olMG cells are found in the INL (n = 4 fish, data obtained from two independent experiments). Needle injuries result in BrdU-positive cells in the ONL, mostly in the rod layer. Except for 1 BrdU-positive olMG cell in one fish, no BrdU-positive olMG cells are detected. GFP-positive olMG nuclei are largely depleted from the INL (n = 10 fish, data obtained from three independent experiments). (D–D'') After needle injuries BrdU-positive cells (magenta) in the ONL are not co-labeled with GS (cyan), indicating that they are not olMG cells (n = 8 fish, data obtained from two independent experiments). (E–E'') After needle injuries BrdU-positive cells (magenta) in the ONL are co-labeled with Recoverin (cyan), indicating that they are PRCs (n = 5 fish, data obtained from one experiment). Scale bars are 10 μm. (F) Quantification of the location of BrdU-positive cells reveals that in all injury types BrdU-positive cells are predominantly located in the ONL (PRC injury: 54 cells in four retinae, needle injury: 550 cells in 10 retinae). ****p<0.0001. Box plots: median, 25th and 75th percentiles; whiskers show maximum and minimum data points. The previous results show that olMG cells re-enter the cell cycle after injuries introduced by needle to the complete retina or by two-photon ablation to the PRC layer. They regenerate PRCs but do not undergo self-renewal. This suggests that olMG cells lack intrinsic factors that trigger self-renewal and multipotency upon injury. One transcription factor which is well known for its involvement in the self-renewal of stem cells – particularly neural stem cells – is Sox2 (Sarkar and Hochedlinger, 2013). It has been shown that cells expressing sox2 are capable of both self-renewal and the production of a range of differentiated neuronal cell types (Sarkar and Hochedlinger, 2013). Data from zebrafish have shown that a ubiquitous gain of sox2 expression triggers a proliferative response of drMGs in the absence of injury (Gorsuch et al., 2017). To investigate the expression of sox2 in MG cells, we performed immunohistochemistry on uninjured retinae in medaka and zebrafish. In the medaka retina, Sox2 protein is detected in amacrine cells (ACs) and olMG cells in the central retina (Figure 6A–6A'''). In zebrafish, the pattern is similar: Sox2 protein is present in ACs and drMG cells in the central retina (Figure 6B–6B'''). This data is consistent with data from other vertebrates including human, whose MG cells also maintain sox2 expression (Gallina et al., 2014). 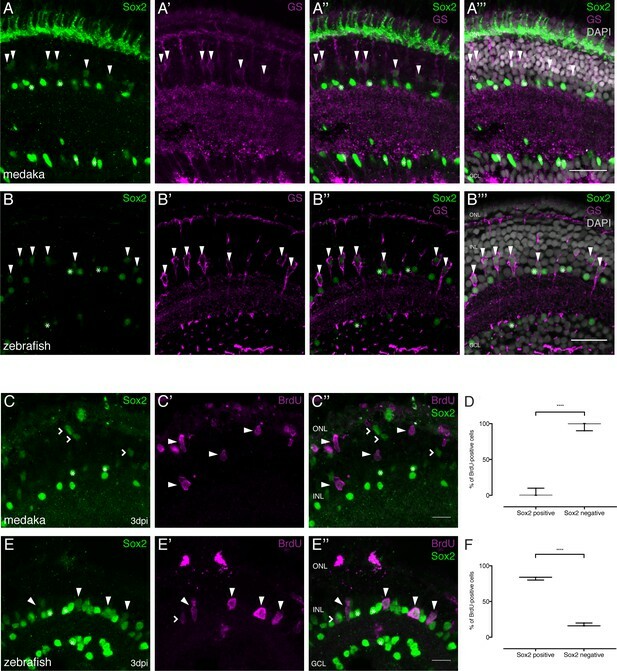 Sox2 is present in MG cells of the hatchling medaka and zebrafish retina but not maintained after injury in medaka. (A–A’’’) Cryosection of an uninjured hatchling medaka retina. Sox2 (green) labeled cells with round nuclei are present in the INL and the GCL. Sox2-labeled cells with round nuclei are ACs present in the INL and the GCL (asterisks). Sox2-positive cells with elongated nuclei are present in the INL (arrowheads). Co-labeling with GS (magenta) proves that cells with elongated nuclei are olMG cells. Additional staining, which is likely unspecific staining since sox2 mRNA cannot be detected there (Reinhardt et al., 2015), can be detected in the ONL. (B–B’’’) Cryosection of an uninjured zebrafish retina at 9 dpf. Sox2 (green)-positive cells with round nuclei are present in the INL and the GCL. Sox2-labeled cells with round nuclei are ACs present in the INL and the GCL (asterisks). Sox2-positive cells with elongated nuclei are present in the INL (arrowheads). Co-labeling with GS (magenta) proves that cells with elongated nuclei are drMG cells. Scale bars are 20 μm. (C–C’’) Cryosection of an injured hatchling medaka retina at 3 dpi. BrdU (magenta, arrowheads) labeled cells are not co-labeled with Sox2 (green, arrowheads). Sox2-positive cells with elongated nuclei, indicating non-proliferative olMG cells, are found in the INL (open arrowheads). Sox2-positive cells with round nuclei are ACs present in the INL and the GCL (asterisks) (n = 3 fish, data obtained from two independent experiments). (D) Quantification of the amount of Sox2-positive and negative proliferating cells of BrdU-positive cells at 3 dpi in medaka (74 cells in 3 retinae). ****p<0.0001. Box plots: median, 25th and 75th percentiles; whiskers show maximum and minimum data points. (E–E’’) Cryosection of an injured zebrafish retina at 3 dpi. BrdU-(magenta) and Sox2-(green) double positive cells can be detected in the INL (arrowheads). BrdU-positive Sox2-negative cells can rarely be detected (open arrowhead). Sox2-labeled cells with round nuclei are ACs present in the INL and the GCL (asterisks) (n = 3 fish, data obtained from two independent experiments). Scale bars are 10 μm. (F) Quantification of the amount of Sox-positive and negative proliferating cells of BrdU-positive cells at 3 dpi in zebrafish (68 cells in 3 retinae). ****p<0.0001. Box plots: median, 25th and 75th percentiles; whiskers show maximum and minimum data points. To investigate the expression of sox2 in the olMG and drMG cells responding to injury by proliferation, we performed needle injuries, incubated the fish in BrdU and fixed them at 3 dpi. We could detect BrdU-positive MG cells both in medaka and zebrafish. The vast majority of proliferating olMG cells did not express sox2 anymore at 3 dpi (Figure 6C–6D, 6% of all BrdU-positive cells were Sox2-positive). We saw a similar scenario in response to either PRC or RGC injury, where 9% and 10% respectively of all BrdU-positive cells were Sox2-positive. Conversely, in zebrafish, sox2 expression was still detected after 3 days in drMG cells that proliferated in response to needle injury (Figure 6E–6F, 84% of all BrdU-positive cells were Sox2-positive). These findings strongly argue that the downregulation of sox2 expression in proliferating olMG cells restricts their regenerative properties. The results presented above indicate that after injury, olMG cells and olMG-derived progenitors do not maintain the expression of sox2, in contrast to the situation in zebrafish. We hypothesize that the prolonged sox2 expression facilitates drMG cells to undergo self-renewal and to generate neurogenic clusters and ultimately all cell types necessary to regenerate a functional retina. To test this hypothesis, we chose the inducible LexPR transactivation system (Emelyanov and Parinov, 2008) targeted to olMG cells (rx2::LexPR OP::sox2, OP::H2B-eGFP) to sustain sox2 expression. In mifepristone-treated retinae, we detected increased levels of Sox2 protein in induced olMG cells (Figure 7A–B''). To address the proliferative behavior of Sox2-sustaining olMG cells in response to injury, we treated fish with mifepristone and BrdU for 2 days, performed a needle injury, maintained the fish in mifepristone and BrdU until 3 dpi and analyzed immediately (Figure 7C). We observed increased formation of proliferating clusters as well as the distribution of BrdU-positive cells in all layers of the retina after needle injury (4 out of 6 fish) (Figure 7D–E'). To address the long-term potential of Sox2-induced olMG cells, we ablated all retinal cell types by needle injury and performed BrdU-mediated lineage tracing as described above. We induced sox2 expression for 2 days and provided BrdU in parallel, performed a needle injury and maintained the expression of sox2 until 3 dpi. 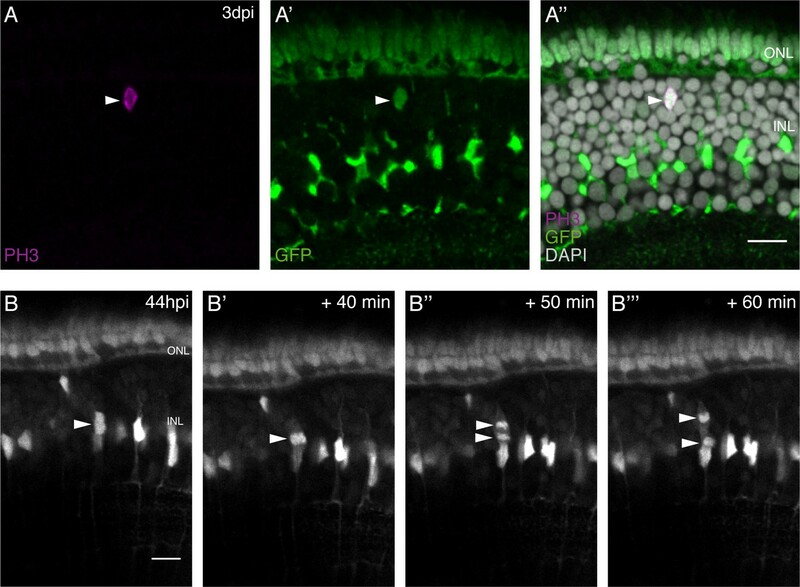 After a chase until 14 dpi, the retinae and regenerated cell types were analyzed (Figure 8A and B). In needle-injured wild-type fish which were also treated with mifepristone as well as in transgenic fish (rx2::LexPR OP::sox2, OP::H2B-eGFP) which were not treated with mifepristone, olMG cells did not self-renew and gave predominantly rise to PRCs, mostly rod PRCs (Figure 8F). In contrast, olMG cells experiencing persistent expression of sox2 showed self-renewal and differentiation into different cell types in the ONL and INL as indicated by BrdU lineage tracing. In particular, the olMG cells maintaining sox2 expression after injury regenerated olMG cells (Figure 8C–C'' and F) and exhibited a significant increase in regenerated ACs and RGCs, which were positive for HuC/D (Figure 7D–E'' and 8F). Furthermore, a slight increase in cone PRCs and a decrease in rod PRCs was observed after sox2 induction (Figure 8C–F). These data indicate that a targeted maintenance of sox2 expression after injury is sufficient to induce self-renewal and increase potency in olMG cells in the medaka retina turning a mono-potent repair system into a regeneration system with increased potency. Expression of sox2 via the LexPR system increases Sox2 protein levels in olMG cells and triggers proliferating cluster formation after injury in medaka. (A) Genetic construct used for sox2 induction. (B–B'') Cryosection of a retina of a mifepristone-induced rx2::LexPR OP::sox2, OP::H2B-eGFP transgenic fish at 5 days after induction. Nuclear-localized GFP (green) labels positively induced cells, which contain an increased amount of Sox2 protein (magenta, arrowheads) in comparison to non-induced cells (asterisks) (n = 6 fish, data obtained from two independent experiments). (C) Induction scheme for sox2 induction. (D–E') Cryosections of mifepristone-induced rx2::LexPR OP::sox2, OP::H2B-eGFP transgenic fish at 3 days after needle injury. BrdU-positive (magenta) cells can be detected in all retinal layers and some BrdU-positive clusters are present in the INL and between INL and GCL (n = 4 fish, data obtained from one experiment). Scale bars are 10 μm. Sox2 induces a regeneration response in olMG cells. (A–B) Induction scheme and construct (B) used for sox2 induction. (C–C’’) Cryosection of a sox2-induced hatchling medaka retina. BrdU-positive (magenta) olMG cells, which are labeled by GS (cyan) can be detected in the INL (arrowhead). Additional BrdU-positive cells are located in the ONL, in the location of both rods and cones (open arrowheads). (D–E'') Cryosections of sox2-induced hatchling medaka retinae. BrdU-positive (magenta) ACs, which are labeled by HuC/D (cyan) can be detected in the INL (D-D'', arrowheads) and GCL (E-E'', arrowheads). Additional BrdU-positive cells are located in the ONL, in the location of both rods and cones (open arrowheads) (n = 7 sox2 OE fish and n = 8 control fish, data obtained from two independent experiments each). Scale bars are 10 μm. (F) Quantification of the location of BrdU-positive cells in sox2-induced fish (607 cells in 14 retinae) versus wild-type control fish treated with mifepristone (341 cells in eight retinae) and transgenic rx2::LexPR OP::sox2, OP::H2B-eGFP fish not treated with mifepristone (218 cells in four retinae) reveals an increase in BrdU-positive olMG cells, ACs and RGCs as well as a decrease in rod PRCs in sox2-induced fish. Wild-type control vs Sox2 OE: Rod PRC **p=0.0031, Cone PRC ns p=0.678, AC *p=0.0434, RGC *p=0.0445, MG **p=0.0083. Non-treated transgenic vs Sox2 OE: Rod PRC ***p=0.0004, Cone PRC ns p=0.528, AC *p=0.0445, RGC *p=0.0445, MG **p=0.0061. Box plots: median, 25th and 75th percentiles; whiskers show maximum and minimum data points. (G) olMG cells respond to injuries by proliferation without self-renewal and restriction toward PRC fate. Targeted expression of sox2 induces self-renewal and increased potency of olMG cells. Here, we have characterized a differential regenerative response between two teleost fish and used it as a framework to address the molecular determinants of regeneration during evolution. By using a combination of in vivo imaging, targeted cell type ablation and lineage tracing, we investigated the dynamics of the injury response in the medaka retina. We focused on MG cells, which play a prominent role in zebrafish retinal regeneration. While upon injury olMG cells re-enter the cell cycle, they fail to undergo self-renewal. Furthermore, olMG cells do not generate the neurogenic clusters which arise in zebrafish, nor do they produce all neuronal cell types in the retina. We traced this effect prominently to Sox2, the expression of which is maintained in proliferating drMG cells after injury, but not in olMG cells. We demonstrated that the sustained expression of sox2 is sufficient to convert an olMG into a dr-like MG cell. The fact that this response is acquired cell-autonomously and in the context of a non-regenerative retina can be relevant for putative translational approaches. Since olMG cells do not self-renew after injuries and only have the capacity to regenerate PRCs, olMG cells are not true multipotent retinal stem cells. Instead, olMG cells should be considered lineage-restricted progenitors. They re-enter the cell cycle between 1 and 2 dpi, similar to the re-entry observed in zebrafish. This indicates that the signals that are essential for cell cycle re-entry are present in medaka and are activated in a window of time similar to that in zebrafish. After retinal injures olMG nuclei migrate into the PRC layer; the cell bodies of nucleus-depleted olMG cells are maintained in the retina. This could be important since MG cell bodies play a crucial role in mechanical stability of the retina (MacDonald et al., 2015) as well as light guiding through the retina (Franze et al., 2007). After retinal injures, olMG cell bodies were maintained in the absence of a nucleus in the INL reflecting the necessity to preserve this structural and optical element. In the uninjured retina, olMG cells express sox2, as is the case for many other vertebrates, including humans. However, sox2 expression in olMG cells is downregulated in response to injury, in contrast to the injury response of drMG cells, which upregulate sox2 (Gorsuch et al., 2017). We speculate that this upregulation is due to epigenetic modifications of the sox2 locus. A recent study in the mouse retina showed that the expression of oct4 is upregulated shortly after injury and then downregulated at 24 hpi (Reyes-Aguirre and Lamas, 2016). This correlates with a decrease in the expression of DNA methyltransferase 3b and its subsequent upregulation at 24 hpi, triggering a decrease in methylation and subsequent re-methylation of oct4. Furthermore, a recent study on zebrafish regeneration discovered the existence of so-called tissue regeneration enhancer elements (TREEs) (Kang et al., 2016). One TREE was associated with leptin b, which is expressed in response to injuries of the fin and heart. This TREE acquires open chromatin marks after injury, can be divided into tissue-specific modules and can drive injury-dependent expression in mouse tissue. This raises the possibility that the sox2 locus in olMG cells experiences epigenetic modifications after injury which differ from modifications in zebrafish. The fact that sox2 expression is detected in all vertebrate MG cells analyzed to date in the absence of injury raises the question whether a decrease in sox2 expression after injury might be a common feature of non-regenerative species like chicken, mouse and even humans. Data from a conditional sox2 knockout in mouse shows that Sox2 is necessary for maintenance of MG morphology and quiescence (Surzenko et al., 2013). While its expression is maintained in response to the injection of growth factors after retinal damage (Karl et al., 2008) its regulation in response to injury alone has not been described. Data obtained in cultures of human MG cells (Bhatia et al., 2011) provide additional important insights. Strikingly similar to medaka, silencing the expression of sox2 caused MG cells to lose stem and progenitor cell markers and adopt a neural phenotype (Bhatia et al., 2011). These findings align well with the results from medaka presented here und suggest that olMG cells and their behavior as progenitor cells can serve as a model for mammalian and in particular human MG cells. The results shown here may provoke an evolutionary question: is retinal regeneration an ancestral or derived feature within the infraclass of teleosts? The question might be resolved by investigations of this capacity in other fish species more closely related to medaka, such as Xiphophorus maculatus, whose last common ancestor with medaka lived around 120 million years ago (Schartl et al., 2013). Additionally, species like the spotted gar, whose lineage diverged from teleosts before teleost genome duplication (Braasch et al., 2016), might provide insights about the ancestral mode of retinal regeneration. Recently, the retinal architecture of the spotted gar has been analyzed (Sukeena et al., 2016). There, proliferative cells have been detected in the central retina likely representing proliferating MG cells, which generate rod PRCs during homeostasis as seen in zebrafish, suggesting that regeneration is indeed an ancestral feature in the ray-finned fish lineage. Additionally, one wonders whether the ability of MG cells to regenerate injured retinal cells is directly related to their involvement in rod genesis during post-embryonic growth and conversely whether the lack of regenerative abilities of MG cells is a result of the lack of rod genesis? The differences in rod layer increase in zebrafish and medaka as well as the differences in rod genesis by MG cells might be due to the natural habitats and photic environment of the fish. While larval zebrafish live near the water surface, adults live in deeper waters where rods become more important for visual function (Lenkowski and Raymond, 2014). Medaka on the other hand are surface fish their entire life, since they live in shallow waters like rice paddies (Kirchmaier et al., 2015) which decreases the need for a massive increase in rods. With a potential translational perspective, regenerating and non-regenerating systems can now be systematically compared to delineate the underlying factors and mechanisms. To date, our cumulative results show that the regenerative potential of olMG cells in the context of homeostasis and injury in medaka resemble that of mammals and birds more than zebrafish. We propose that this provides an added value to medaka as a model species for regeneration studies that bridge the differences between zebrafish and mammals. Studies of heart regeneration that have compared zebrafish and medaka lend additional support to this statement (Ito et al., 2014; Lai et al., 2017). As reprogrammable multipotent retinal stem cells, MG cells harbor a great potential for treating degenerative retinal diseases. Our work indicates that the addition of a single reprogramming factor facilitates a regeneration-like response mediated by olMG cells. Their multiple resemblances of features of mammalian and human MG cells position them as an ideal model for the development of new treatments preventing the degeneration and initiating the regeneration of the retina. Medaka (Oryzias latipes) and zebrafish (Danio rerio) used in this study were kept as closed stocks in accordance to Tierschutzgesetz 111, Abs. 1, Nr. 1 and with European Union animal welfare guidelines. Fish were maintained in a constant recirculating system at 28°C on a 14 hr light/10 hr dark cycle (Tierschutzgesetz 111, Abs. 1, Nr. 1, Haltungserlaubnis AZ35–9185.64 and AZ35–9185.64/BH KIT). The following stocks and transgenic lines were used: wild-type Cabs, rx2::H2B-eGFP, rx2::lifeact-eGFP, rx2::H2B-eGFP QuiH, rx2::LexPR OP::sox2 OP::H2B-eGFP cmlc2::CFP, rx2::CreERT2, GaudíRSG (Reinhardt et al., 2015), AB zebrafish and Albino zebrafish. All transgenic lines were created by microinjection with Meganuclease (I-SceI) in medaka embryos at the one-cell stage, as previously described (Thermes et al., 2002). For BrdU incorporation, fish were incubated in 2.5 mM BrdU diluted in 1x Embryo Rearing Medium (ERM) or 1x Zebrafish Medium for respective amounts of time. For induction of the LexPR system, fish were induced by bathing them in a 5 µM to 10 µM mifepristone solution in 1x ERM for respective times. For induction of the Cre/lox system, fish were treated with a 5 µM tamoxifen solution in 1x ERM over night. For in vivo imaging fish in a Cab background were kept in 5x 1-phenyl-2-thiourea (PTU) in 1x ERM from 1 dpf until imaging to block pigmentation. Fish in a QuiH background could be imaged without any treatment. Fish were anesthetized in 1x Tricaine diluted in 1x ERM and mounted in glass-bottomed Petri dishes (MatTek Corporation, Ashland, MA) in 1% Low Melting Agarose. The specimens were oriented lateral, facing down, so that the right eye was touching the cover-slip at the bottom of the dish. Imaging and laser ablations were performed on a Leica (Germany) SP5 equipped with a Spectra Physics (Santa Clara, California, USA) Mai Tai HP DeepSee Ti:Sapphire laser, tunable from 690 to 1040 nm and Leica Hybrid Detectors. A wound was introduced using the bleach point function or the region of interest function, together with the high-energy two-photon laser tuned to 880 nm. The wound size was defined between 40 and 60 µm diameter for medium-sized wounds. Wounds bigger than 60 µm diameter were defined as large wounds. Rx2::H2B-eGFP or rx2::lifeact-eGFP fish were used for the ablations. Since rx2 is expressed during retinal development residual GFP could be visualized in rod PRCs as well as in RGCs when increasing the gain of the Hybrid Detectors. Follow-up imaging was performed using same laser at 880 nm and a 40x objective. Larvae (zebrafish 5 dpf, medaka 8 dpf) were anesthetized in 1x Tricaine in 1x ERM and placed on a wet tissue. Under microscopic visualization, the right retina was stabbed multiple times in the dorsal part with a glass needle (0.05 mm diameter). Left retinae were used as controls. Fish were euthanized using Tricaine and fixed over night in 4% PFA, 1x PTW at 4°C. After fixation samples were washed with 1x PTW and cryoprotected in 30% sucrose in 1x PTW. To improve section quality, the samples were incubated in a half/half mixture of 30% sucrose and Tissue Freezing Medium (Leica) for at least 3 days. 16-µM-thick serial sections were obtained on a Leica cryostat. Sections were rehydrated in 1x PTW for 30 min at room temperature. Blocking was performed for 1–2 hr with 10% NGS (normal goat serum) in 1x PTW at room temperature. The respective primary antibodies were applied diluted in 1% NGS o/n at 4˚C. The secondary antibody was applied in 1% NGS together with DAPI (1:500 dilution in 1xPTW of 5 mg/ml stock) for 2–3 hr at 37˚C. Slides were mounted with 60% glycerol and kept at 4°C until imaging. BrdU antibody staining was performed with an antigen retrieval step. After all antibody stainings and DAPI staining, except for BrdU, were complete, a fixation for 30 min was performed with 4% PFA. Slides were incubated for 1 hr at 37°C in 2 N HCl solution, and pH was recovered by washing with a 40% Borax solution before incubation with the primary BrdU antibody. TUNEL stainings on cryosections were performed after all other antibody stainings were completed using the In Situ Cell Death Detection Kit TMR Red by Roche. Stainings were performed according to the manufacturers protocol with the following modifications. Washes were performed with 1x PTW instead of PBS. All immunohistochemistry images were acquired by confocal microscopy at a Leica TCS SPE with either a 20x water objective or a 40x oil objective. Images were processed via Fiji image processing software. Statistical analysis and graphical representation of the data were performed using the Prism software package (GraphPad). Box plots show the median, 25th and 75th percentiles; whiskers show maximum and minimum data points. Unpaired t-tests were performed to determine the statistical significances. The p-value p<0.05 was considered significant and p-values are given in the figure legends. Sample size (n) and number of independent experiments are mentioned in every figure legend. No statistical methods were used to predetermine sample sizes, but our sample sizes are similar to those generally used in the field. The experimental groups were allocated randomly, and no blinding was done during allocation. Investigative Opthalmology & Visual Science 52:136–145. The Journal of Neuroscience 35:15612–15634. Progress in retinal and eye research 40:94–123. Development, Growth & Differentiation 49:145–154. Journal of Experimental Zoology Part B: Molecular and Developmental Evolution 326:403–421. Thank you for submitting your article "Activating the regenerative potential of Müller glia cells in a regeneration-deficient retina" for consideration by eLife. Your article has been reviewed by two peer reviewers, and the evaluation has been overseen by a Reviewing Editor and Diethard Tautz as the Senior Editor. The following individuals involved in review of your submission have agreed to reveal their identity: Alejandro Sánchez Alvarado (Reviewer #1) Pamela A Raymond (Reviewer #3). This paper investigates whether medaka and zebrafish have the same capacity for retina regeneration. The authors find that in contrast to zebrafish, medaka (Oryzias latipes) has limited regeneration capacity. They also show that Sox2 expression is not maintained to the same extent in medaka Müller glia (MG) as in zebrafish. Forced expression of Sox2 grants medaka MG cells traits, which are more similar to injury responses observed in zebrafish. In general this is a well-executed study with highly advanced and beautiful imaging. 1)Subsection “olMG cells reenter the cell cycle after injury but do not generate neurogenic clusters!” – The statement that medaka Müller glia are quiescent in juveniles cites a previous study (Lust et al., 2016) dealing with embryonic and larval stages, not juvenile fish. The present study also appears to use larval fish (8 days post-fertilization), as stated in the Materials and methods section. The authors need to clarify the stages being used for the reported experiments. For example, the layer of rod nuclei in the ONL in the larval medaka retina (e.g., Figure 1A,B) is a scant one-cell thick, whereas in adult medaka retinas, there are 2-3 rows of rod nuclei (e.g. Imanishi et al., 2007,). During this early larval period, as in all species of teleost fish studied, rod photoreceptors accumulate gradually, and they are generated by rare stem cell divisions of Müller glia and the rapidly dividing rod progenitors they produce, which migrate apically into the ONL and differentiate into rods. Addressing this concern, therefore, is important. 2) Subsection “olMG nuclei but not their cell bodies are depleted after PRC injuries” and Discussion section – The statement that after photoreceptor injury medaka Müller glial "nuclei migrate apically into the wound site but remain there" and that "cell bodies are maintained at 10 days after injury in the absence of a nucleus in the INL" whereas radial glial fibers remain intact is not entirely justified. The only marker used for cell nuclei (in Figure 3) is the transgenic rx2:H2B-eGFP reporter; another possible interpretation of the results is that this reporter is no longer expressed in Müller glia that responded to the injury. This possibility is supported by the in vivo image in Figure 3A,A',A'', in which the arrowhead points to a Müller glial radial fiber labeled with rx2:lifeact-GFP cytoplasmic reporter. careful examination shows a 'hole' of reduced fluorescence in the soma, which likely corresponds to the nucleus in the inner nuclear layer (INL). In Figure 3B, the injury site in the ONL is not apparent, and co-localization of BrdU and GFP is not readily apparent. 3) Subsection “olMG cells divide in the INL with an apico-basal distribution” – The data measuring cleavage plane of dividing Müller glia are not robust (only 6 cells were examined). In the example shown (Figure 4B), there is no obvious damage in the photoreceptor layer. How do the authors exclude the possibility that these dividing cells could be neuronal progenitors in the rod lineage, reflecting normal development, not regeneration? The PH3 labeled cell (Figure 4A) and the mitotic cell (Figure 4B) could both represent rod progenitors. Note that the mitotic cell in Figure 4B is slightly above and in front of a Müller glial nucleus with a distinctive glial shape (elongated, polygonal), which could indicate that the mitotic cell may be a Müller-derived, early progenitor in the rod lineage. 4) Subsection “Sox2 expression is not maintained in proliferating olMG cells after injury” – The authors find that proliferating cells in medaka do not sustain Sox 2 expression and don't form neurogenic clusters. Based on these data they assign a role to Sox2 in MG cells. Nevertheless, there are a fairly large number of Sox 2 expressing cells in medaka after injury (Figure 6). Thus, a major role of Sox2 might be sustaining proliferation in the cycling progeny of MG cells rather than only determining MG cell fate. Along the same line, it would be important to quantify Sox2 expression after the different injury models rather than just carrying out comparisons between the two species in the same injury model. More importantly: one wonders what is the percentage of Sox 2 expressing cells that are BrdU+? This is the counting that would support the conclusion reached rather than the percentage of BrdU+ cells that are Sox2+. This is insufficient information: how many cells were counted and from how many retinas? 5) Subsection “Sustained Sox2 expression restores olMG driven regeneration” – Figure 7. No evidence is provided for induced expression of Sox2 in Müller glia. The effect of overexpression of Sox2 on 'regeneration' is very small, and only a single marker (HuC/D) was used to identify retinal cells. The co-localization of HuC/D and BrdU is not convincing in the absence of a panel showing HuC/D only. The quantification data are incomplete; only percentages shown, no information on number of cells counted and number of retinas. Several experiments would strengthen the conclusions in Figure 7. Please show that more MG cells express Sox 2 for example with double staining with GS. Please comment on whether MG progeny form proliferating clusters after sustained Sox 2 expression. A movie (of similar kind that is shown earlier) would be a very nice illustration to demonstrate the increased regenerative response by MG. Wildtype animals treated with mifepristone were used as control. Would be also necessary to show the control with the transgenic line without drug. 6) Discussion section – No evidence is provided for depletion of the medaka Müller glia or for "symmetric division into two differentiating cells, depleting the olMG pool". In fact, Figure 3B, B' shows that in the region designated as a photoreceptor lesion at 2, 4, and 6 days after injury, labeling with the glial antibody glutamine synthetase (GS) shows that radial fibers of Müller glia persist at densities equivalent to the flanking, uninjured regions. These results are contrary to the conclusion that Müller glia are converted into photoreceptors by a symmetric division. 1) Subsection “olMG cells reenter the cell cycle after injury but do not generate neurogenic clusters!” – The statement that medaka Müller glia are quiescent in juveniles cites a previous study (Lust et al., 2016) dealing with embryonic and larval stages, not juvenile fish. The present study also appears to use larval fish (8 days post-fertilization), as stated in the Materials and methods section. The authors need to clarify the stages being used for the reported experiments. For example, the layer of rod nuclei in the ONL in the larval medaka retina (e.g., Figure 1A,B) is a scant one-cell thick, whereas in adult medaka retinas, there are 2-3 rows of rod nuclei (e.g. Imanishi et al., 2007,). During this early larval period, as in all species of teleost fish studied, rod photoreceptors accumulate gradually, and they are generated by rare stem cell divisions of Müller glia and the rapidly dividing rod progenitors they produce, which migrate apically into the ONL and differentiate into rods. Addressing this concern, therefore, is important. We agree with the reviewers that the stages used (hatchling fish, 8dpf) need to be clarified and we have changed it accordingly throughout the text. We are now referring to the fish as hatchlings, which is the same stage we used in our previous studies. Since the referees had pointed out that in Figure 1A, B the ONL of medaka is only one-cell thick and thicker in adult medaka of the mentioned study (Imanishi et al., 2007) we additionally provide now a new figure (new Figure 1—figure supplement 1) highlighting the differences in photoreceptor compositions in uninjured medaka and zebrafish both at 8dpf and in adults using immunohistochemistry for markers of rods and cones and DAPI. While zebrafish have one layer of rod PRCs at 8dpf and at least three layers of rods in adults, medaka basically maintain the rod layer from embryonic to adult stages. Those data clearly explain the difference in rod-production. While medaka rods are born by progenitors after the exit from the CMZ, which we show by Cre/lox-mediated lineage tracing (new Figure S2), rods in zebrafish are derived from drMG cells, explaining the difference between the two species. We have introduced a new paragraph into the Results section highlighting this important point at the beginning of the manuscript. In our experience, GFP is best stabilized in a conformation where it is fused to histones. In Figure 3A-A'' we used a double transgenic line: rx2::lifeact-eGFP, rx2::H2B-eGFP, where the same regulatory element drives H2B-eGFP as well as lifeact-eGFP. The fact that the MG fiber is still visible indicates that rx2-driven lifeact-eGFP is still expressed. Additionally, H2B-GFP is a highly stable fluorophore, which is present long after its transcription had been downregulated. Together these findings argue against a loss of GFP due to inactivity of the corresponding regulatory element and rather support an alternative scenario, the loss of the H2BeGFP expressing nuclei. To make this point clearer, we adjusted the text describing these results and also the figure, clearly indicating that a double transgenic fish line had been used. To illustrate the absence of nuclei in olMG fibers forming in response to injury we added another panel to Figure 3 (Figure 3B-B'''') showing DAPI and GFP stainings at 3 dpf in rx2::lifeact-eGFP retinae. To make the injury site and the GFP and BrdU co-localization more apparent we adjusted the former Panel 3B (now 3C) to clearly show the overlap of GFP and BrdU. We could only observe PH3 positive cells in the INL in injured fish. Given that, together with the fact that MG cells in medaka are quiescent at the stage examined and as outlined above and in contrast to zebrafish do not generate rod PRCs, we believe that these PH3-positve cells are injury-responsive MG cells. We followed the advice of the referees and have also quantified the number of Sox2+ MG cells after PRC and RGC injury, where we see a very similar trend as in the needle injuries and included this data now in the text. With respect to the percentage of Sox2 expressing cells that are dividing cells we are a bit confused by the request of the referees. What we focus on in the manuscript is the response of olMG cells to injury and more specifically the question: is sox2 maintained in injury responding cells? Since in medaka only injury-responsive olMG cells are BrdU+, we find that it is necessary to analyze how many of these BrdU+ cells still express sox2 and how many do not. Apparently, we have not been able to state that clearly in the submitted version of the manuscript. We have therefore adjusted the text describing this experiment with a more detailed description. Additionally, a large number of Sox2-expresing cells presented in the figure are not olMG cells but rather Amacrine cells, which also express Sox2 in homeostatic conditions and can be distinguished from MG cells due to their position and nuclear shape. We clarified those points in the revised version of the manuscript in both, text as well as in the figures. Moreover, we have now included the numbers of cells counted and the numbers of retinae used in the figure legends. We have addressed all of the points raised by the referees here and have extended existing figures and introduced data from new experiments. To show that Sox2 is expressed in mifepristone induced MG cells of the transgenic rx2::LexPR OP::sox2 OP::H2B-eGFP line we performed additional experiments and have introduced a new Figure 7, which shows the increased amounts of Sox2 protein in induced olMG cells. To address the formation of proliferating clusters after sustained Sox2 expression we have performed additional experiments. As an alternative to the suggested life imaging over extended period of time, we now present additional data of fixed retinae, which were analyzed 3 days after injury. Sustained expression of Sox2 triggers cluster formation as an injury response. We detected the formation of BrdU+ clusters of proliferating cells as well as the distribution of BrdU+ cell intro all layers of the retina indicating the enhanced potential of the olMG cells in presence of sustained Sox2 levels. We have included this data in the new Figure 7 of the revised manuscript. To better visualize the co-localization of BrdU and HuC/D, we have changed the previous Figure 7 (Figure 8 in the revised manuscript), so that the HuC/D label is shown alone. Additionally, we have extended the figure legends now stating all the numbers of cells counted and the numbers of retinae used. Finally, as requested, we have now included data for the transgenic fish, which were not induced with mifepristone, but underwent the same injury, BrdU pulse and chase timeline. We see the same results as in the wildtype control fish, which were treated with mifepristone and the data is now included in the quantifications in the revised Figure 8. We agree to the point raised by the referees and have rephrased the Discussion section of the revised manuscript accordingly. We agree that we had presented limited mechanistic insight related to the mode of division of olMG cells and have therefore omitted this part of the discussion. We have clarified the discussion of the cell bodies of olMG cells losing their nucleus in response to injury. As outlined above (Point 2) the fibers persist and we now only discuss the depletion of the olMG nucleus and the putative role of the olMG cell bodies which are likely not functionally equivalent to normal olMG cells. Animal experimentation: Animal experimentation: Medaka (Oryzias latipes) and zebrafish (Danio rerio) stocks were maintained as closed stocks in a fish facility built according to the local animal welfare standards (Tierschutzgesetz 111, Abs. 1, Nr. 1), and animal experiments were performed in accordance with European Union animal welfare guidelines. The facility is under the supervision of the local representative of the animal welfare agency. Fish were maintained in a constant recirculating system at 28°C with a 14 h light/10 h dark cycle (Tierschutzgesetz 111, Abs. 8 1, Nr. 1, Haltungserlaubnis AZ35-9185.64 and AZ35-9185.64/BH KIT). © 2018, Lust et al.